Today we got rained out. We were unable to open the nets due to heightened risk to the birds and so enjoyed the ability to sleep if for the first time in quite a while. As is customary on rain days I did a census anyways. We have occasionally got as few as two species on rain day censi (censuses?) so I thought it would be a waste of time. I however got 24 species including a flock of 50 Black Swifts heading north over the banding station. This is a very unique observation for the station, especially since they were migrating in the wrong direction for this time of year. TLBO has been “my” project since its inception seven years ago. It is a monitoring project designed to follow the fall seasonal movement (migration) of birds south through the valley. 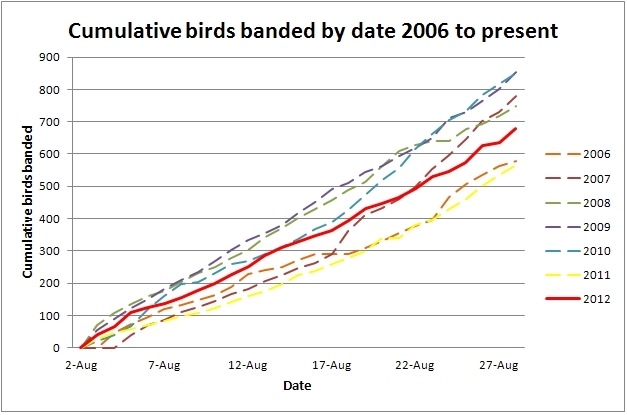 Science tells us that at least 10 years of data are needed to statistically illustrate true trends in bird monitoring data. TLBO follows standards set by the Canadian Migration Monitoring Network, of which we are a member. We are thrilled to have now received our very own federal banding permit for the station…we thank the Canadian Wildlife Service, Delta, for supporting the first six years under their federal permit. NCC owns six properties in the Tatlayoko valley and surrounds, and conservation of such biological targets as migratory birds, Grizzly Bears, wetlands and old-growth Douglas-fir forests are primary objectives. Mainstays of TLBO are the banders, the volunteers, and the valley project managers. We have been fortunate to have had three main banders over our first seven years- first Steve Ogle (whose bird photo heads this page), then Chris Chutter (database manipulator extraordinaire), and now Avery Bartels (young birder who spends his winters in Colombia). The latter two have worked in tandem for the past 2 1/2 seasons and write this blog each day. Our volunteers usually visit and help for a week at a time. Primarily from B.C., they have also come from Ontario, Alberta, and now, by coincidence, from Colombia. My wife Gail, is one of these volunteers, back for a seventh time. Peter and Roma Shaughnessy are the NCC project managers for Tatlayoko. They coordinate and orient volunteers, occasionally provide the banders with home baking (hint! ), fix fences, monitor bluebirds, and generally act as NCC ambassadors for this beautiful valley. The banding station has grown from an open tent to a well-designed building with solar power and opening walls (built by Peter S.). Data entry is now directly into computer spreadsheets rather than paper forms that blew around in the frequent wind. We think that TLBO sits in the most beautiful landscape of any station in Canada. It is with pride that we show new people NCC’s work here, and TLBO in particular. NCC’s B.C. Region Board of Directors visited TLBO for the first time last week and was treated to a tour of the station and a demonstration of bird capture, identification, and banding. 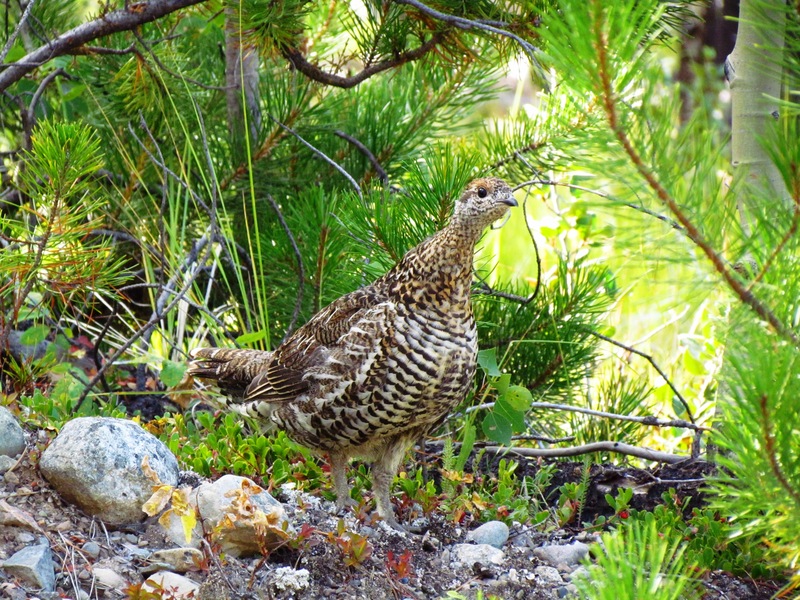 Showing a volunteer from South America her first Spruce Grouse is a wonderful thrill. If you read this blog (and I do daily), please consider visiting and helping TLBO continue for future years. Holding a just-banded American Redstart and then releasing it to fly to Central America is a rewarding experience that is priceless. A slower day at the station overshadowed by a steady breeze out of the north and a threat of percipitation that eventually hit about an hour before scheduled closing, forcing us to shut down early. Once again Warbling Vireos were the only passerine thats seemed to be present in any sort of numbers, other than the ubiquitous Pine Siskins. Our first adult White-crowned Sparrow of the season was notable as was yet another warbler highlight, this time a Blackpoll Warbler! Our first of the season and 5th banding record for the station. 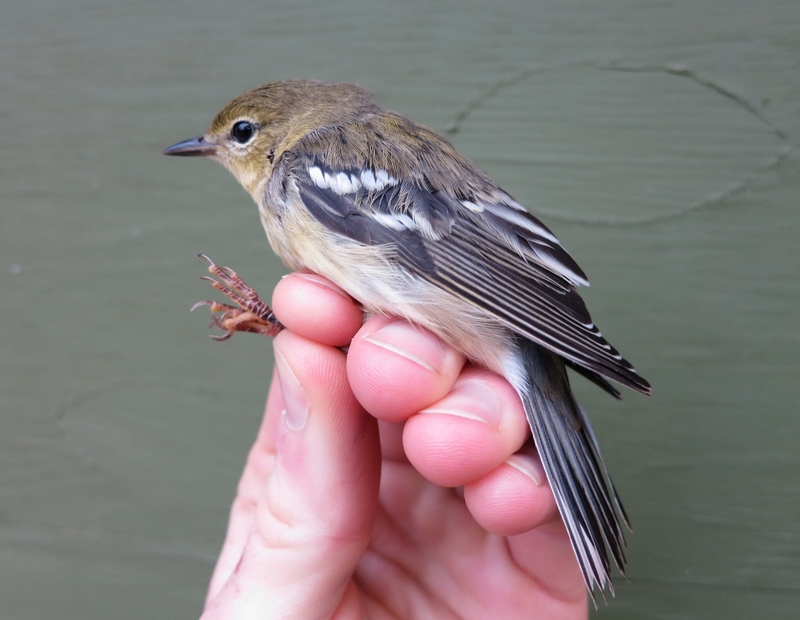 This amazing little bird that weighed a mere 12 grams (without any fat stored up) will migrate across the canadian boreal, through Ontario and down to the eastern seaboard. During this first part of it’s migration it will be able to stop and feed when necessary but the next leg is out across the Atlantic Ocean, non-stop, to the north coast of South America. This 3000km stretch will take it between 3 and 4 days to complete. Once on the coast of Venezuela it will rest and recover it’s fat and muscles resources before finishing it’s trip to the Amazonian lowlands. Over the 2 months that it will spend in transit it will cover over 10 000km…and in four months, it will repeat it’s journey in reverse to return to it’s breeding territory in northern British Columbia….Ain’t migration great?!!! Census was uneventful from a birding perspective but it ended in with a nice mammal encounter. 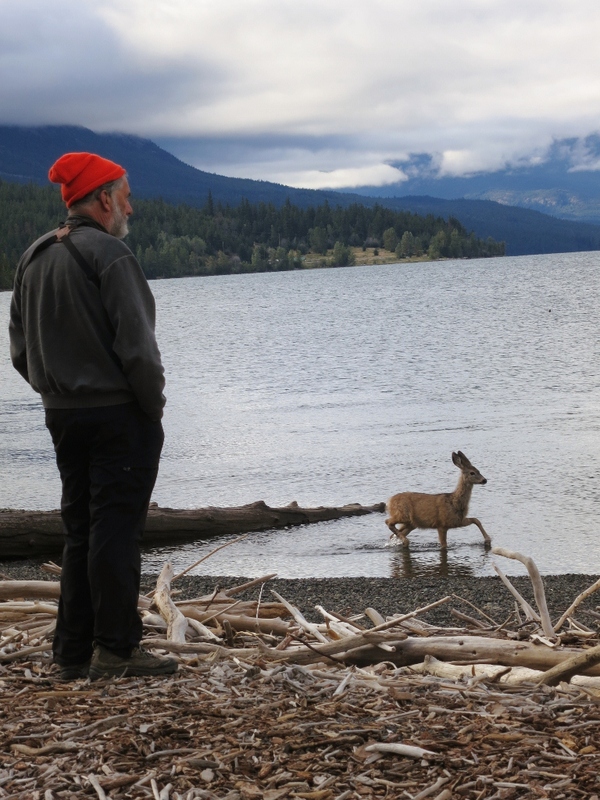 As we stood on the beach scanning the water, a doe Mule Deer walked quietly along the shore and past us coming within 15 feet of Andrew, fifty feet behind it’s fawn did the same thing! Though a neat experience for us you can’t help think that, even for a deer, this particular doe was seriously lacking in the “instinct for self-preservation” department. On the lagoon the season’s first two Northern Shoveler’s were mixed in with American Wigeon, Mallard, Green-winged Teal and a lone Pied-billed Grebe. As we got back to the lab after census Gail passed me a brilliant male American Redstart from net 1. It was a recap and it turns out that it was banded here in 2008 as a hatch-year bird, making it 4 years old! Not bad for a neotropical migrant. Another decent days banding with a total of 30 new birds caught. Warbling Vireos once again were around in high numbers, reflected in the fact that they made up almost half of our total catch. In with the vireos were 3 Black-capped Chickadees, one a recap banded last year, always a pleasant surprise. 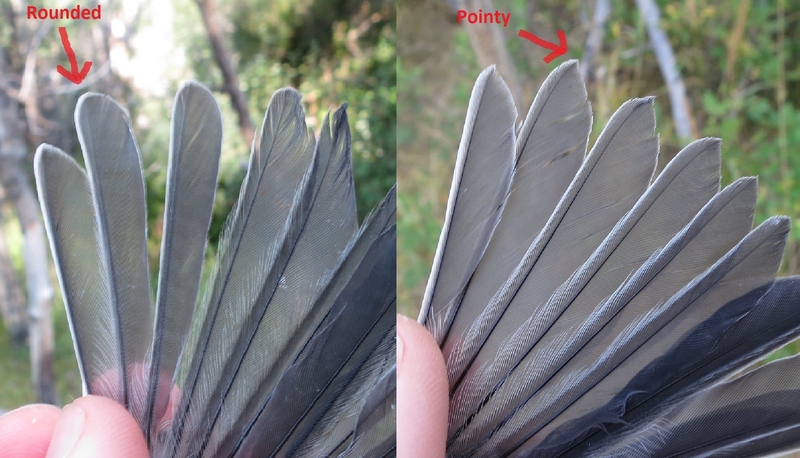 Chickadees are easy enough to age on tail shape, note the rounded tail feathers (rectrices) of the after hatch-year bird on the left and the more pointed rectrices of the hatch-year on the right. In addition the white extends up the outer web and around the end of the feather on the AHY and not on the HY. After a good start to the morning the wind picked up from the south and activity died down with just a couple birds/net round. A little push of late flycatchers, 2 Hammond’s and 2 Dusky’s, made for a nice comparison between these two very similar species. A highlight for the girls was yet another Sharp-shinned Hawk, an extracting tick for Gail and banding tick for Laura! This was our 4th in 5 days putting us on 6 for the season. We nearly had another one when a female buzzed Andrew as he sat outside the lab and hit net 1, unfortunately Andrew’s reaction time was diminished after last nights birthday revelry and the sharpie got away. While the rest of us were off on a net round Chris saw our first black bear of the season eating berries behind net 1. We have been hearing crashing from that area for a couple days now but this was our first visual confirmation of its…ursineness….ursinance?….ursinocity? hmm… well, regardless, with the aid of the air horn and a couple well aimed stones he dissuaded it from sticking around (unfortunate for Laura as she really wants to see one during her visit here). Today had a really slow beginning and a really slow ending, but was pretty busy in between. In fact due to a couple big net runs we wound up finishing the day with our second highest banding total of the season. This is weird as two days ago stands as our busiest day to date, yesterday as our slowest, and today as our second busiest. Today was a huge day for Warbling Vireos with 14 new birds banded. That means more Warbling Vireos banded today, than all birds together banded or recaptured yesterday. That is despite having to close three nets early today due to high winds. Our highlight captures today were our third Sharp-shinned Hawk in four days and our first Fox Sparrow of the season. Our highlight observation was our second Steller’s Jay of the season. Time to show the cumulative banding total graph. We are so far doing better than 2006 and 2011, which should not be a surprise as 2011 was a terribly slow year and at this time in 2006 we still had not worked out our net locations. We have a ways to go to catch any other year, but it is definitely picking up at the station and we are optimistic. 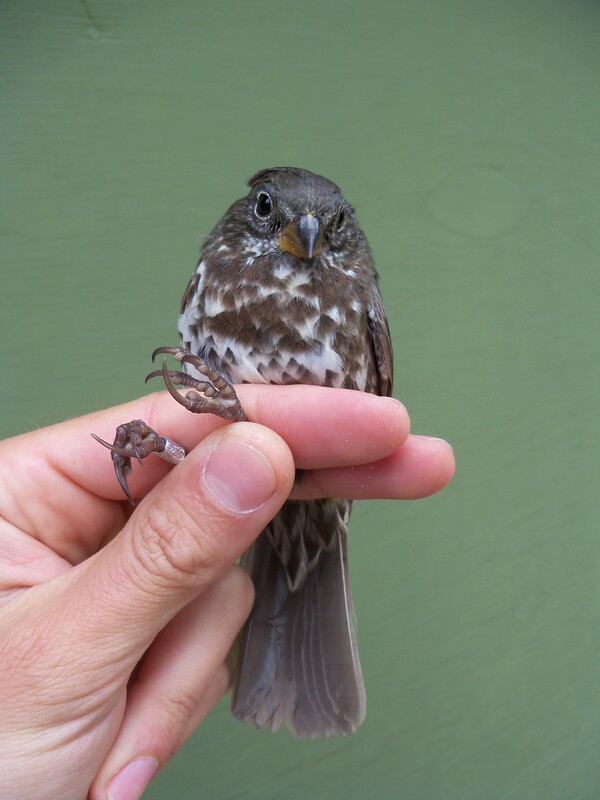 The picture above is of our first Fox Sparrow of the year, but I can’t caption it because wordpress is full of bugs that need fixing. WordPress please contact me for a list of bugs that need fixing. A windy morning here at Tatlayoko today. Beaufort 4 breezes from the south kept half of our nets closed and seemed to have blown the birds out of the valley as we banded a grand total of 10 birds, 4 of which came on our first net round. Census was equally slow for Chris, Andrew and Laura although they had nice waterfowl diversity on the lagoon with Northern Pintail and Green-winged Teal joining the regulars. The only birds that appeared to be enjoying the weather were falcons. Both Merlin and American Kestrel were seen zipping across the field throughout the morning, seemingly just for the sheer pleasure of of it! The Merlin took a bit of time to harass the crows as well. Hopefully the wind switches around and tomorrow we have something to write about again. Aug. 26 – It’s Maggie Time! Well I got back from my brother’s wedding just in time it would appear. Myself and new volunteer Laura Cardenas from Colombia arrived at the station at 7:30 this morning to news that the others were extracting a whole whack of Pine Siskins from net 6. Most of a flock had hit the net and in total 15 were caught in that one net alone! After a busy 10 minutes in the banding lab I headed off on census with Andrew Harcombe. Though activity was high right around the lab, most of the census was fairly quiet. An Olive-sided Flycatcher perched atop the woodpecker snag was the first bird recorded, a nice start, and a number of Swainson’s Thrushes, Yellow-rumped Warblers, Cedar Waxwings and the ubiquitous Pine Siskins had the trees near net 13 hopping. On the lagoon Andrew and I had a small flock of American Wigeon and Green-winged Teal while out on the lake a season high 4 Common Loons were loafing. 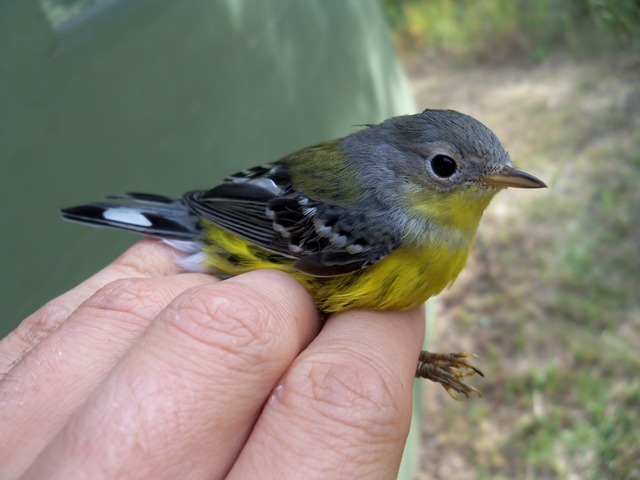 During our absence Gail Harcombe pulled yet another exciting warbler out of net 12…the station’s 4th ever Magnolia Warbler! The warbler extravaganza just keeps on keeping on! Hopefully this cool weather will continue bringing us interesting birds and the good numbers that seem to be starting to arrive in the valley. Overall we banded a season best 51 new birds, with the big catch being Pine Siskins accounting for exactly 1/3 of that. Hatch year Magnolia Warbler, probable male. Other banding highlights include Western Tanager and Hairy Woodpecker. The tanager was our fifth of the season, a good year for them in our nets after just catching 1 in 2011. A few season to date stats: so far we have caught 625 birds total making our projected total 1536 birds, still below average but if activity remains high this week those numbers could change dramatically. In addition we have recaptured 134 birds, 22 of which were banded prior to this season.